In the dark of night, an elusive figure breaks into the royal menagerie and steals four magic animals, your childhood companions and dearest friends. It is up to you to save them! Take the journey to discover more about the Dark Minotaur who threatens the magical world. Can you save them in time? 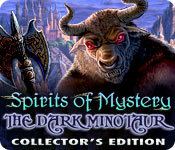 Spirits of Mystery: The Dark Minotaur Collector's Edition is rated 4.4 out of 5 by 95. Rated 5 out of 5 by patspuppz from Great Game I would give it 6 stars if I could! Rated 5 out of 5 by lepredot from Probably the best game I've played so far. This game is definitely the best game I've played on all levels. The graphics are gorgeous. The gameplay is really intriguing - definitely not your usual game elements and concepts. I was surprisingly delighted with the Bonus Play. That was worth buying the Collector's Edition. The only disappointment was that I wanted to interact more with the Minotaur. Still the overall excellence of the game, plus the Bonus Play made up for the disappointment. Totally recommend this game. Rated 5 out of 5 by Runningbear214 from Reminiscent of of Eternal Journey: New Atlantis LENGTH: I'm a fast player on most of these games (except 'MCF Return To Ravenhurst' of course) and this one, had I played it strait through, would have taken around 23 hours of play to do. I'm glad, as it was nice and relaxing!! I played it on EASY mode (always do, first time thru). FUN FACTOR--as always, HO games are addictive. The scenes were nicely jumbled, and I liked the fact that you had the normal HO scenes mixed with finding the matching silhouettes. The puzzles where somewhat easy, but nice. GRAPHICS: Beautiful, not as good as some, but better than many! STORY--interesting, and I loved the magic animals in it. I kept forgetting to use them, then would do a "d'oh" when I hit HINT. *L* As with Eternal Journey, New Atlantis, where the 'rooms' where the hidden datascreens were marked on the map, this game (the CE, anyway, dunno about the regular version) marks where the morphing objects are. For me, that's kind of a spoiler, but you can always ignore the map and try to find them yourself it it bugs you! OVERALL--I would recommend this to any HO player, and hope y'all agree!! Rated 5 out of 5 by smartvalerie from Fantasic Fun I loved this game, it was bright and colourful. Played on easy and got most of the way through before I had to use the sg. HOs were of 2 kinds some you had to find and some you got just the outline and these were interactive. Good story well told. I never felt that halfway through they got fed up and hurried it as with some games. Beautiful scenes. Still have the extra chapter to play but it is a game that stands alone and will make a good SE. Thank you BF and Devs. Rated 5 out of 5 by mabearfor3cubs from This was pretty easy to figure out. This was pretty easy to figure out. Great visual, sound with a good storyline. Can't wait to play the whole game. Rated 5 out of 5 by tkoenig60 from Great Series! Hope there are more future games in this series! Really enjoyed the game play, storyline and graphics. Could be a little more challenging, but there are 3 different player levels so I let my rating score reflect that. Overall I really liked this game a lot and look forward to more! Rated 5 out of 5 by SolarEclipse from A Worthy Addition to the Series I thought “Sprits of Mystery: The Dark Minotaur” was a good addition to the series. I’m not disappointed that there wasn’t more interaction with the “Dark Minotaur.” The whole point was to rescue the animals and keep him from coming to life. There was enough of his snarling and shrieking in the menu screen when you pressed the play button. I had to cover my eyes. I couldn’t have taken much more. Knowing that was the potential outcome, that was enough to keep me motivated. I didn’t want to see anymore of him. So, the sooner he was defeated in the game…the better. ERS has tried some interesting things as others have mentioned in their more recent games. I liked the portals that were used to transport you to different areas within the game. The animals having special powers was interesting, but it was somewhat underutilized…and hilarious. Like sometimes they would give you an object that you needed, but most of the animals weren’t acquired until later in the game. That was a unique part of the game, but I wish they would have expanded upon it more. The other noteworthy element was Isa’s (The Royal Hunter) magic powder that allowed you to go through the portals. His entrances and exits with his panther were always spectacular. ERS is so strong when it comes to creating interesting characters with such noteworthy attributes. Whether it’s the animals with special powers or the quirky characters, they just all fit so well into their environments. 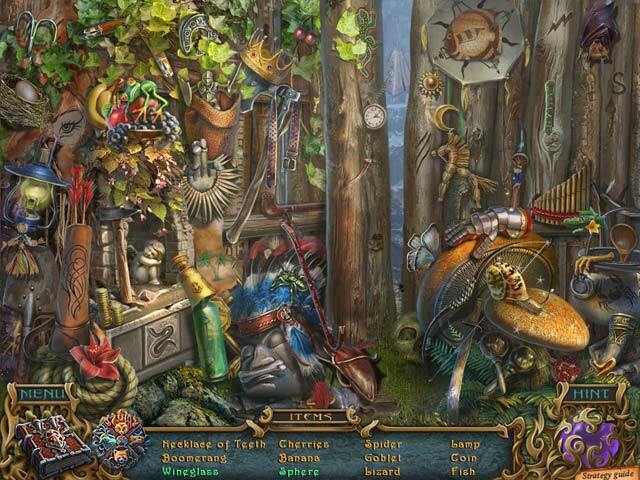 The hidden object scenes were a combination of old and new. 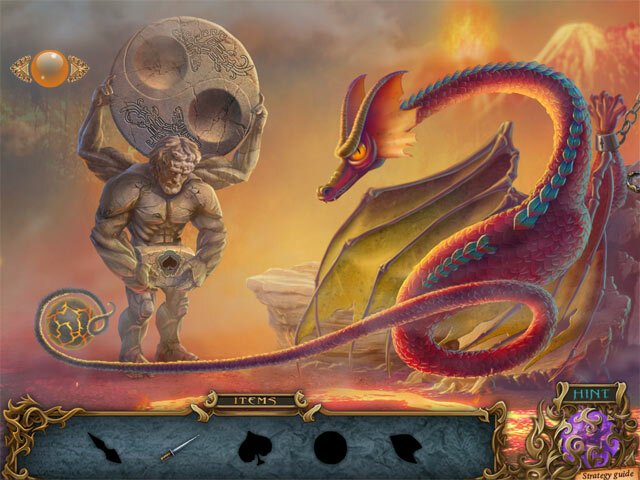 Although, it would be harder to do an entire game with the other type of elaborate and more intricate hidden object scenes, I think it would be worth it. The graphics were bright and colorful. There were a couple of scenes after the beginning where the graphics seemed inconsistent, but that was remedied rather quickly. The strategy guide is deceptive with respect to the length of the game. Pages 1-42 for the main and 43-55 for the bonus. It was longer than I thought it was going to be. However, I do sort of feel that the bonus chapter should have been part of the main game as it gave a more complete ending to the story. I’m starting to question the logic of developers making a “Bonus Chapter” because in most cases it would have been better served to include it as part of the main story. Overall, this was a good game. I wish it could have gone on a bit longer. But I would recommend it if you liked the first two in the series. ERS is definitely improving. I can’t wait to see what they have in the works for 2013. Rated 5 out of 5 by seaside2 from Worthy HOG/Adventure game I found this game to have interesting game play, great graphics, and a gentle story. I enjoyed all the cleverly designed creatures. Minimal frustration except for some language questions. I did use the SG:I'm not too proud to admit it! The CE is worth it for it's length, new gameplay and HAPPY ENDING! This game is not too creepy or gross; in fact it has a lot of beautiful and amusing elements. Rated 5 out of 5 by nannieof3 from great game liked the story line, good graphics, great puzzles! Rated 5 out of 5 by shaboody from Loved it!! The extra game was great! It was very detailed. Rated 5 out of 5 by pmanuel from Good game A pretty good challenge, and the storyline is easy to follow. Liked it. Rated 5 out of 5 by kirni from Amazing visual experience! I really loved this game because of its delicate design and visual effects. A real fairytale feeling! The playing is enjoyable with all the fantastic colors and small details with challenges, as games inside games, cool! Some surprisingly animated when you least expect it, I love it! Rated 5 out of 5 by kcasey503 from really a 4.5 game This is my favorite "Spirits of Mystery" game. The unique plot (rescuing kidnapped magical menagerie animals), character twists, and pervading sense of urgency made the game interesting and full. The animals were cute, but not too cutesy. I thought the voicing was excellent (I've found that this is an important component in the quality of a game), and I'm pretty sure one voice actor had some good Shakespearean acting under his belt. Like other ERS games, there is substantial interaction with minor characters, which I find to be important to the "fullness" of the game. The mini-games were fun and varied, and I found them to be mostly in the easy to intermediate range. There didn't seem to be as many locations as in similar games, but the portal between the "worlds" isn't just kept open; it takes a lot of time and work to open them as needed. There's no map for this game, but personally that works for me There are two timed aspects to the game that add a lot: having to find food for the rescued animals whenever they get hungry, and an invisibility spell that wears off after a certain time. They certainly made the game more absorbing, but I spent a lot of time frantically looking for Chester's bamboo so he wouldn't starve to death (although I doubt it was really a Neopets-type of situation), and panicking because the invisibility spell sometimes wore off at inconvenient moments. The first thing that made this game a 4.5 affair for me was the ending (or the two endings, since the CE includes bonus play). It wasn't clear in either case when the story was over, it just stopped. Silently. "Why are the fireworks going off? Oh, I guess it's the end." Honestly, just a few wrap-up sentences, fairytale- style, would have done the trick. The second thing -- what was up with the minotaur motif? He had actually very little to do with the story. However, my fondness for appealing, charismatic Chester the Red Panda (even when he was cranky) made up for all that, and got my official rating up to five. Thanks for this absorbing game. Rated 5 out of 5 by jmcbeauty from Good Sequel Spririts of Mystery: The Dark Minotaur Collector's Edition is an excellent next step in this series. The art was beautifully done and the music fit the story as it proceeded. The magical animals that were stolen from the menagerie were cute and as the story progressed you remet Isa and his panther and Nanny. It doesn't show Thyrian at all, but as the animals are "yours" it makes senses the "you" have to find them. The puzzles were fairly simple and the items in the hos were fairly easy to find. As I am in the middle of moving, I could easily go back and not lose track were I was. Overall, it was a good game to play (used it as a reward for completing so much and with time limit to play) and I found it relaxing and enjoyable. Back to packing. Rated 5 out of 5 by LynFrank from This game is very cleverly made - with the mix of the dark and the light perfectly matched The graphics are very clear and colourful, the pace is fairly steady and the mystery keeps one quite intrigued. I am not one for many words, but this would have to be a favourite of mine especially because of the replay content and the marvelous colours used. Thank you Bigfish!! Rated 5 out of 5 by skborneman from Awesome Game I had alot of fun playing this game!! Actually I wish there were more like this I would purchase right away, was fun, not overly done and just enjoyable, I love the fairy type games and the what I call fantasy games, Please give us more as I would purchase right away !! Just a fun and enjoyable game and what a change from the evil monsters to children games !! Rated 5 out of 5 by HooterHoops from Very enjoyable Not usually the type of game that I play but I really enjoyed it and will be purchasing it after this review is complete! Highly recommend! Rated 5 out of 5 by shamriockpog from Enchanting This game was, for me, way better than I had hoped for. I loved the Spirit of the Phoenix and the Amber Maiden so I had high hopes for this one. It was even better than the others. The graphics were beautiful and the game was so much fun. The story line was 'cute'. The developers put in so many 'extras' that were not necessary but added to the overall game. If I had to use one word to describe the game, I would say "enchanting". I would recommend this game without any hesitation. Rated 5 out of 5 by felixgarnet from Stunning! What can I say about this game that hasn't already been said? It's glorious to look at and listen to, has a proper plot (I assume it ends well - I'm only half way through), offers challenges I found fun rather than frustrating at Casual Level and has such a multitude of HOGs, mini-puzzles and tasks, including "virtual animal care" that it's impossible to be bored! Hints and help are at hand plus a comprehensive Strategy Guide but are not intrusive. This is a great game for first play of the New Year for beginners and seasoned gamers alike. A well-deserved 5 stars all round from me. Rated 5 out of 5 by Jem_Jerrica_Guy from false advertising Only 2 scenes of minotaur, but the game comes full circle as the collector edition has you come back home to bring your animals to their homes safely. 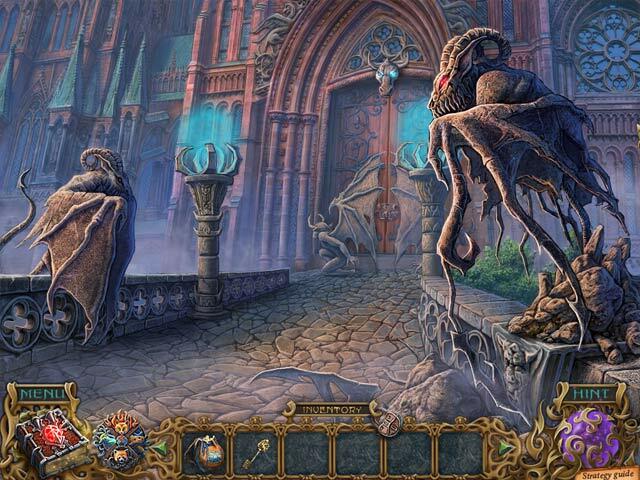 The portal system and hidden object puzzles are another innovation from ERS. Rated 5 out of 5 by Katiendan from I Loved It! To date, this is one of my favorite HO + Adventure games! The graphics are absolutely beautiful, the storyline is engaging and it has a nice mix of hidden object and adventure aspects - and it isn't super "dark" like some of the other HO games I've played. If you like HO/Adventure games, I would highly recommend you give this one a try. Rated 5 out of 5 by cb1966_de from I would buy it! Excellent I played the 1 hour version ans enjoyed every minute. The graphics of the game is well presented and there is a big look on details. If the normal version will come out I would buy the game, as I am interesting how the story is going on. The good point is also that you can skip the dialogs and the help not say where is the next solution to find. It say only that the actual area has nothing to do in the moment and to search in another location. Rated 5 out of 5 by brainsxx2 from engrosed, never heard any outside noise!! loved this! Going to get the rest! Rated 5 out of 5 by MsReddFox from Awesome Game! I've been waiting for another Spirits of Mystery game, and I'm not disappointed! I like it better than the first two, and I really liked both; Amber Maiden, and Song of the Phoenix. This game is so much fun! I knew about ten minutes into that I was going to buy it. So I did. It's not overloaded with HO's, and the ones that are there are not hard to do. They're sharp and clear, not hard to find, and some interaction is always in each one. The mini games are really fun to do, not your run of the mill; I've only had to skip one later in the game, which I'm not finished with yet but plan to do tomorrow night. I'm heading in the last chapter. The graphics are great and you meet different characters as you go through the scenes. This is a game that I'll play many times. Personally, the length seems ok to me, but it's one of those games that you don't want to end. If I have any complaint at all it's that there is no map, so there is some traveling back and forth; not too bad, though until you get towards the end. I always prefer games that have maps, but in spite of no map in this one I still give it 5 stars. I love this game! Rated 5 out of 5 by sharon_mntr from Hope there's a part two I never write reviews for any games I play,but I had to for this one. I really enjoyed it! I hope there will be a sequel.This game kept me interested. I just loved it. Rated 5 out of 5 by puppynurse from AWESOME CHALLENGE I thought this game was terrific, frustrating at times, but not overly so, I wish there was a map but there was not and if that was the one thing I could change about the game it would be that. The scenery was beautiful, the characters fun and interesting. I thought there was a good balance of HOS and mini games. Some of the mini games were harder than others but none were I felt the need to skip, Instructions on mini games were sufficient, The help button was not always helpful but many times you have to stop and think of what to do next. The strategy guide stays on the page you left it on and is very helpful in tough spots. The collectors edition, is well worth it not just for the guide, but the wallpapers, and extra bonus play. Find out who stole your magic animals, and reveal the secret of the Dark Minotaur.